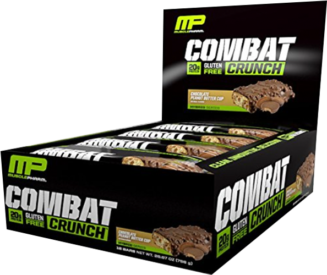 Home » MusclePharm® Combat Crunch Protein Bar Review — Are They Too Chewy? 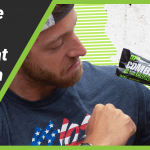 MusclePharm® Combat Crunch Protein Bar Review — Are They Too Chewy? Founded in 2008, MusclePharm® is a sports nutrition company that makes a variety of products for all types of strength athletes. One of their more popular products comes in the form of protein bars, aka the Combat Crunch bar. 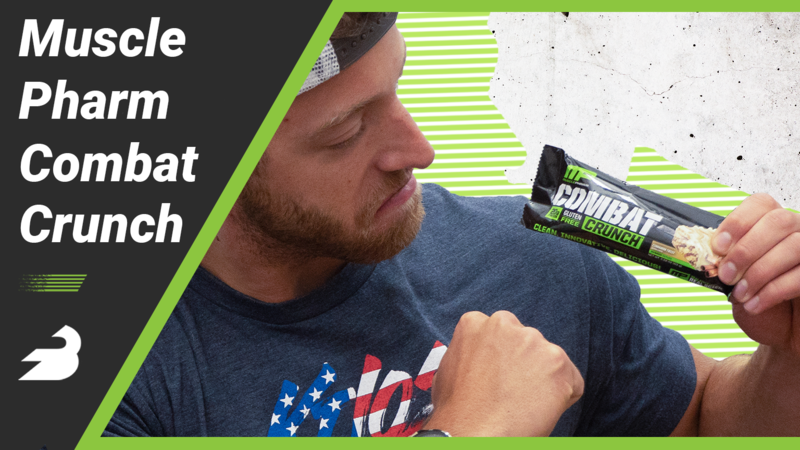 The Combat Crunch protein bar boasts higher fiber, lower sugar, and a solid boost of 20 grams of protein. For strength athletes everywhere, protein bars can be an easy way to get a “healthier” snack that’s loaded with extra protein, and they’re great on-the-go. 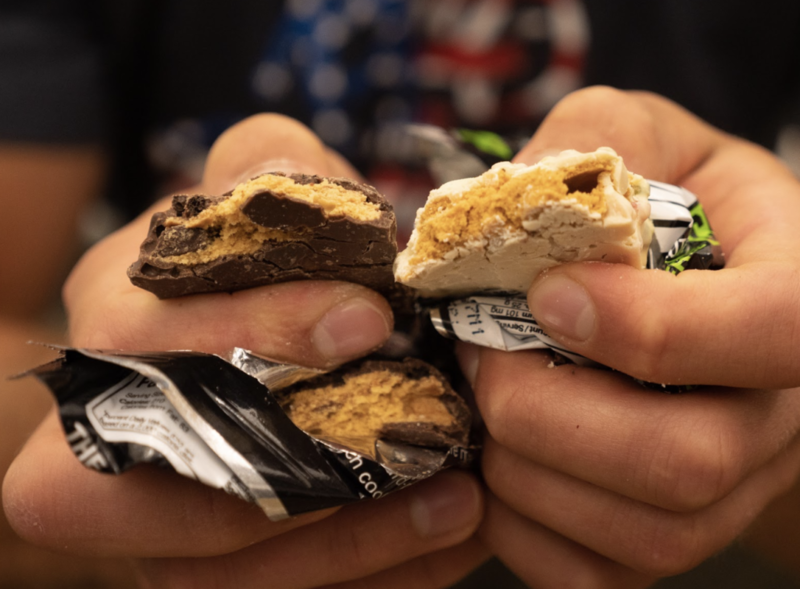 That being said, we’ve been testing the best protein bars across the industry and we reviewed the MusclePharm Combat Crunch bars to see how they stack up. In this review, our editor assessed the Combat Crunch bar’s taste, texture, nutrition, price, and much more. So how did these bars stack up to other popular brands on the market? Read on to find out! An enjoyably chewy protein bar that's closer to a baked pastry than many of its competitors. 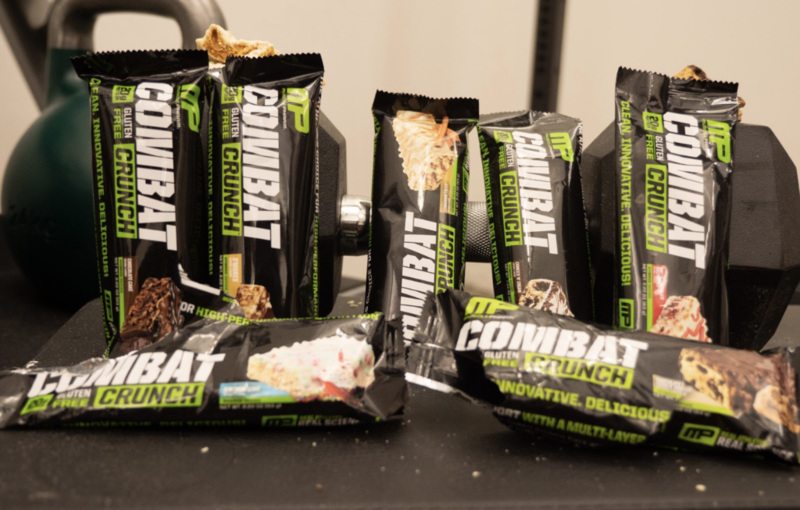 For this review, I assessed seven MusclePharm Combat Crunch bar flavors. In every protein bar review, I take the taste in conjunction with the texture of the bar to fairly assess how the two come together to create their synergistic taste. 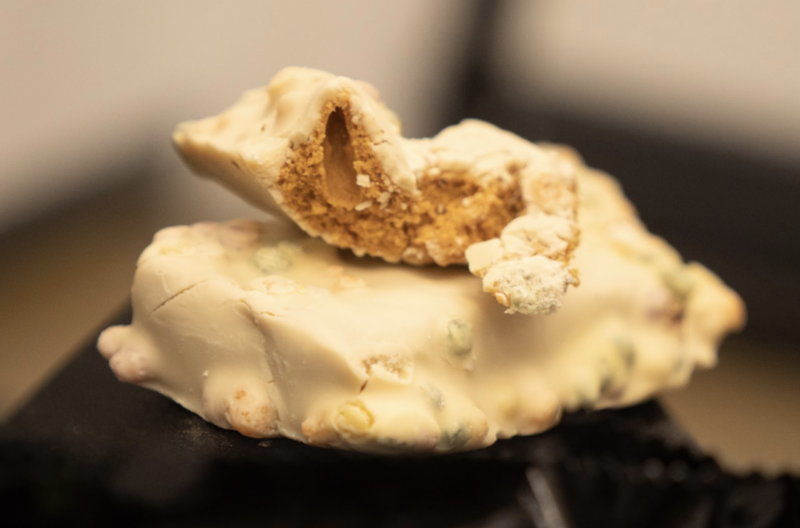 Texture can be a huge feature for protein bars, as they often aim to nail a sweeter more dessert-esque flavor, so sometimes relying on flavoring alone isn’t tough. Overall, the bars all had somewhat similar taste components, but don’t get me wrong — there were a few standout bars. For example, each bar has a slight tinge of something that’s been synthetically sweetened and doesn’t capture the set flavor directly. In addition, the bars are all pretty similar in how much chew they have, and in my opinion, were a little more chewy than the bars I typically reach for — they almost had a taffy-like bite, which is something they claim not to on the packaging. One of my favorite parts of these bars were the unique textures that each came along with. I mentioned it earlier, but I thought these bars were a little too chewy for boasting that they don’t have the taffy-like protein bar texture, yet their other texture components were a huge hit in my eyes. The glaze on the top, additional things like sprinkles, and extra layers of flavor really made each flavor unique. Were they always a hit in taste? No, but I admire the effort MusclePharm put into formulating a full bar experience. Below, I’ve included a chart of the seven bars reviewed. These scores are based off of two things. First, the bars within this review alone, second, the bars I’ve previously had and reviewed. The flavor and textures scores are the averages of what I’ve experienced before. I’m not going to lie, this bar was nearly perfect in my eyes. I loved the cinnamon flavoring and thought the texture was an awesome compliment for this subtly sweet bar. In my opinion, this bar reminded me a lot of Cinnamon Toast Crunch, not necessarily because it tastes the same, but in how it delivers its cinnamon-sweet goodness. The bar didn’t drown itself out by overdoing the cinnamon, which I was a big fan of. I had high hopes for this flavor, but unfortunately, I was let down. Birthday cake flavors tend to be a hit with most companies, so I thought it would be fair to assess Combat Crunch’s Birthday Cake flavor with the same high regard. All-in-all, this is a bar I could not eat everyday, and I thought its flavor really missed the mark on its potential. It had a super synthetic taste, and it wasn’t very sweet, so it kind of was just “blah”. In terms of nutrition, I think MusclePharm put together a pretty solid bar that’s consistent across the board. Some companies have bars that vary pretty greatly in calories and macronutrients, but the Combat Crunch bars are all consistent. For fat content, you can expect to find 7 grams per bar, and for carbohydrates there are 25 grams. In respects to protein, every bar comes with 20 grams, along with 12 grams of fiber and 5 grams of sugar. 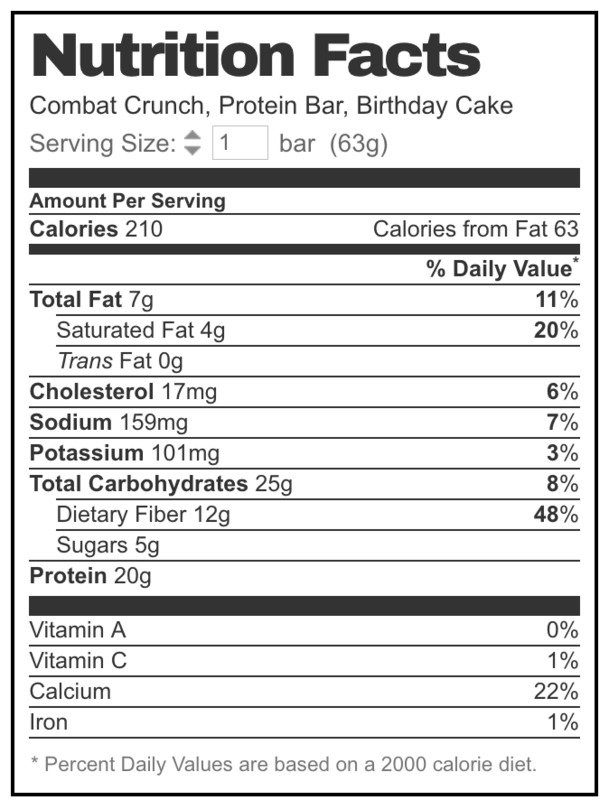 Below is the nutrition label for the Combat Crunch Birthday Cake protein bar. If you’re looking for a bar with minimal ingredients, then the Combat Crunch bar may not be the bar for you. The bar’s ingredient list isn’t too incredibly long, so it falls right in the middle of a simple, more natural ingredient list, and something that’s incredibly processed. 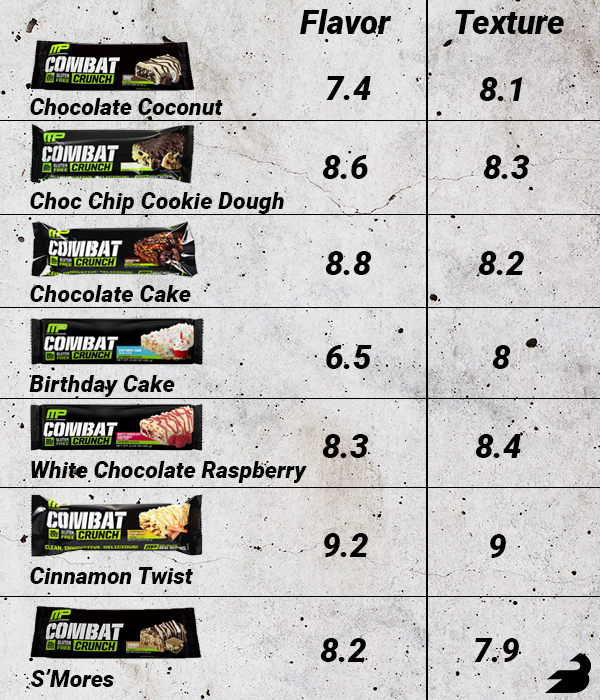 Check out the Combat Crunch Birthday Cake’s ingredient list below. Ingredients: Protein Blend (Whey Protein Isolate, Milk Protein Isolate), Isomalto-Oligosaccharide (Prebiotic Fiber), Vegetable Glycerin, Sugar, Vegetable Oils (Palm, Palm Kernel Oil), Almonds, Water, and Maltitol., Contains less than 2% of: Cinnamon, Resistant Maltodextrin, Salt, Soy Lecithin, Natural Flavor, Malt, Natural Colors, Rice Flour, Corn Syrup, Citric Acid, and Sucralose. Consistent calories and macronutrients across the board for all of the bars. Lower price per bar and four or twelve bar package. Inconsistent taste between bars, which makes it tough to love them all. Possible digestive discomfort with the higher fiber and ingredient list. Five grams of sugar, which could be a turnoff for some athletes. One positive aspect that comes along with these protein bars is their price. For many, protein bars are considered a “designer” food and come with a higher price tag, but the Combat Crunch bars are pretty reasonable. If you want one bar, then you can expect to pay around $2.79. For a box of twelve, the price tag comes around $20.00, which is about $3-7 cheaper than most brands. All-in-all, the MusclePharm Combat Crunch bars weren’t my all around favorite bar, but they had a few big positives to them. For example, the Cinnamon Twist bar is one of my now all-time favorite bars, and their nutrition label is consistent and solid across the board. My main gripes come in with the inconsistent tastes and the slight digestive discomfort they gave me. If you want a bar that has consistent nutrition, then the Combat Crunch bars could be a good pick for you.